1. 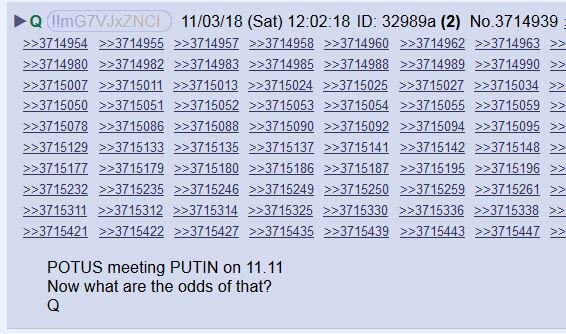 #QAnon asks, what are the odds of POTUS planning to meet with PUTIN on 11.11, given all the foreshadowing #Q's given us of suggesting an impending historical importance of this date? 2. 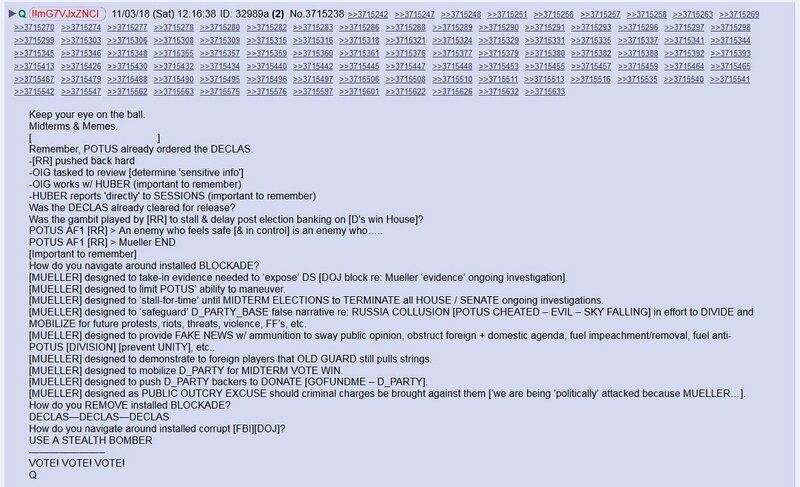 #QAnon #2397 Keep your eye on the ball. VOTE! VOTE! VOTE! Midterm Memes have no searchable target text. ... [D+R+I] funded organization to donate massive amounts of money to the D party in an effort to sway an election? Was the gambit played by [RR] to stall &amp; delay post election banking on [D's win House]? POTUS AF1 [RR] &gt; An enemy who feels safe [&amp; in control] is an enemy who…. #QAlert 11/3/18 this will be my thread for all #QPosts for Saturday November 3, 2018. What are the odds of that! and more!